Hello! I’m Amber Skye Forbes, a novelist and poet. My first book is When Stars Die and is part of The Stars Trilogy. It was published by AEC Stellar Publishing Inc., in 2013, but is now represented by Gnome on pig Productions. My first two poems published simultaneously in Sleeve are “Girls Must Be Dolls,” and “Curse,” both of which have been pulled from my collection currently titled Pretty Girl, Unravel Me. I’m currently 27 years old. At 19, my first short story, “Dead Poet’s Pendulum,” was published in The Oddville Press, a magazine that unfortunately folded. However, it can still be read here in Google’s lovely archives. I also had two parts published in Sorean: A Gothic Magazine, titled “Victoria’s Asylum of Maggots” in issues 4 and 5. I am also the founder of The Corner Club Press. Being an author isn’t solely what I do. I am a personal trainer, nutrition coach, and strength coach and have been so for about 2 years. In fact, this is what I primarily do now, and I am back in school with the aim of getting in a doctor of physical therapy program. I love to read young adult novels, binge on anime and manga, learn everything I can about nutrition and fitness, chill with my husband, wear different shoes at the gym every day, workout, do some kickboxing, and dream about living in New York. You can find out more about my life by following me on Instagram. Subscribe to newsletter. You can sign up here. I hope you all enjoy what you find on my website! I try to blog often to keep things fresh. This was my favorite role in my dance school’s recital: Wind. My fiancé took this picture. 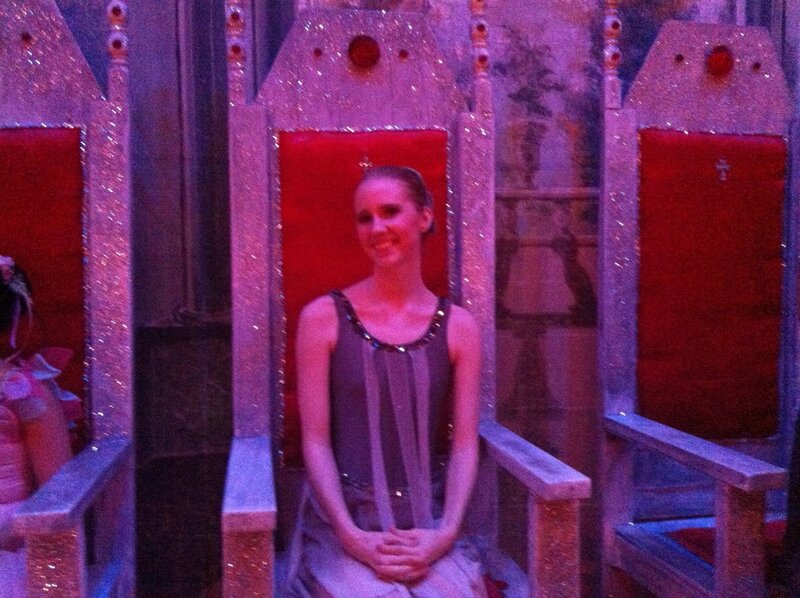 This is me sitting on the thrones of Lucy, Peter, Edmund, and Susan. Congratulations on your book being selected for publication through AEC Stellar Publishing! That’s great Amber! I wish you the very best of luck in your writing career! Thanks for joining me in my journey through daily life! Hi Amber! Thank you so much for following my blog! Thank you all for following my blog and leaving comments and you’re welcome as well! Thank you for following my blog and commenting and everything! I too struggle with mental illness (especially when I was a teenager at high school) and believe so strongly in removing the stigma around it and expressing it through my writing! I can’t wait to read more of your blog! Thanks for following! Your blog looks very interesting. I will definitely read more. I nominated you for the Very Inspiring Blogger Award because of your personal way of writing! Thanks for the follow, which is how I found you. I look forward to reading more here. I love to dance and write too! Yay! I love to meet others who dance too. The dancing community on WordPress is fairly small, I’ve noticed. I know. I’ve yet to meet someone here that loves to dance and write as well until now. I hope you’ll continue to do both! Best wishes to you. Hi, I have nominated you for The Bouquet Of Three award :). Thank you for the follow. I wish you much success in your writing career. I read some of the stuff on your website and absolutely love your style! I would love to read your book, when its published. Great ‘About’ page! I’m going to keep you in mind for editing in the future. Thank you! Keep in mind that I’m very willing to do sample edits. I wouldn’t say they’re words of wisdom, lol. Just simply my experiences. Thanks for dancing by my blog, Amber 🙂 Blessings on your writing and publication! Will follow you to see where it all leads. Hello Amber Skye Forbes., You have a great writings here..Keep it up..Enjoying Blogging.. Thanks for following my blog. Congrats on the acceptance of your first book! I’ll keep watch for it and would love to review it. My heart is also with those young people who struggle with darker issues and in offering hope. I found you through Tumblr. Which platform has worked best for you – Tumblr or WordPress? In regards to my audience, being teens, I would say Tumblr. It’s much easier to connect with my audience there than on here, but WordPress has been great for garnering connections with other writers who can potentially help me with the marketing of my book. Hi, Amber, I’m hoping you haven’t gotten this award yet, so I can give it to you 😉 It’s the Sisterhood of the World Blogging Award. Details at http://1writeway.com/2013/09/21/more-awards-more-mea-culpa/. Enjoy! I really love you talent, Amber. I’d be happy for you to guest blog anytime. I have great admiration for the fact that you deal openly with your mental illness. Many people are frightened to talk about such matters so it is refreshing to meet you! I need to get back into blogging about it. I find myself straying from it when I’m stable, but if I want to consider myself an advocate, I know I need to post about it every so often. Thank you so much! Feel free to offer suggestions, too, on what you yourself would like to read. You are so welcome! I love your blog. It’s always a delight to stop by and check out new posts. Congrats! You are nominated for the Beautiful Blogger Award. Thank you so much! And thank you for the other award, too. I’ll eventually update my blog to reflect those awards. But thank you again! Thank you! I hope it finds another home soon. Hi, thank you for following me. I like the design of your blog. And it’s nice to see other writers here on WordPress. Thank you. It’s always great to meet other writers and see what they add to their blogs. A belated thanks for the follow, Amber. I look forward to checking out your own blog as well. It looks as if you’re going great guns with all your goals. Hi, thank you for the follow. Please tell all your friends to come visit my blog and I’ll do likewise. Thank you very much. Thanks for following, Amber. It’s tough out there. Good luck finding another publisher. Hi, I’m glad that you didn’t forget about me. And congratulations. I like good titles, they grab my attention. I’m rushing now, so take care. Thanks! This gives me some great blog fodder. Absolutely! Id love to hear your answers! It’s a pleasure to learn more about you and your passion for writing, Amber. I look forward to exploring your The Stars Trilogy! Thank you! I finally found a publisher for it, so maybe it’ll be this year or the next.